Tensor Bullet Bond Tactile Adhesive is the recommended adhesive for Brutus Tactile Ground Surface Indicator Mats. The adhesive bonds Brutus Tactile to foam, rubber, some plastics, tiles and concrete (excluding brushed concrete). 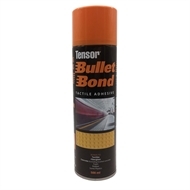 Featuring a six-way adjustable nozzle, Tensor Bullet Bond is easy to use. Full bond strength is reached in 24 hours with tack off achieved in one to two minutes.